Situated in one of the most sought-after locations in Naples, Florida, Marbella Lakes is a gated community of attached and single-family homes. 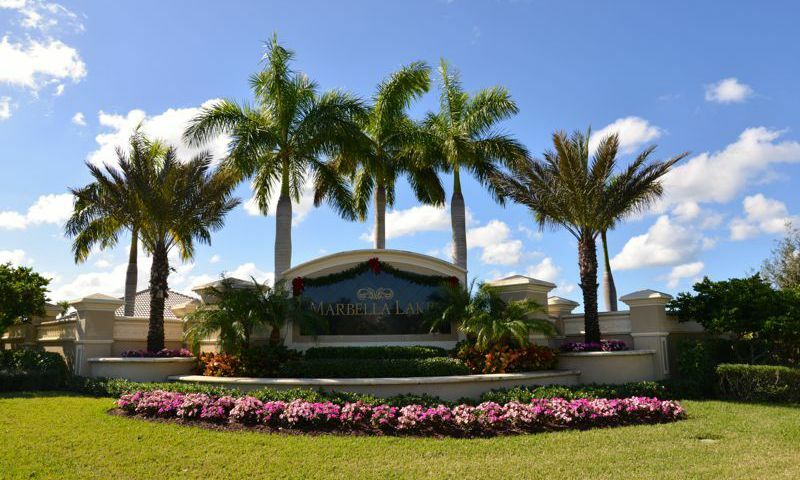 Marbella Lakes was established in 2009 and all 490 residences were completed by 2013. Natural landscaping abounds and is punctuated by stately pine, oak and palm trees. Visitors and residents are greeted by an elegant tower structure and substantive architectural trellis. The elevated gatehouse accommodates residents with dedicated, oversized lanes and guests with a sheltered lane. It is smartly adorned with columns, cast stone accents and corbels for welcoming all homeowners in style. Marbella Lakes is open to buyers of all ages but the amenities and-low maintenance homes are especially appealing to active adults. A main feature of the the community is its three-and-a-half acre waterfront recreation area that includes an 8,000 square-foot clubhouse. The clubhouse features an extensive air-conditioned indoor sports court for indoor volleyball and basketball play in addition to its fitness center. Other indoor social areas include a billiards, game room, business center, and a social hall with a catering kitchen. The latter is suitable for large club meetings and smaller private functions alike. Outdoors, the grounds boast a resort-style pool with a spa, sundeck, kids splash pool and tot lot, a basketball court, two Har-Tru tennis courts, and a gazebo. There are also plenty of walking and biking trails throughout the community as well as scenic lakes and ponds for residents to admire Marbella Lakes' natural beauty. Marbella Lakes' single-family homes have two or three-car garages and come in a variety of floor plans designed to offer from 2,144 to 3,513 square feet of air-conditioned space. These layouts have two to six bedrooms and two-and-a-half to five bathrooms. Some of the larger models come with dens or loft space. Buyers can select from an array of attached homes that provide between 1,534 to almost 2,288 square feet of living space. The attached homes have two to four bedrooms, two to three bathrooms, and one or two-car garages. Some of the models include a den. All homes come with complete appliance packages, granite counter tops in the kitchens and bathrooms, ceramic tile flooring, and brick pavers. The layouts also feature screened and covered patios for ultimate enjoyment of the Florida sun. While not age-restricted, Marbella Lakes holds a great appeal for active adults and retirees who want resort-style amenities and like the option of a busy and social lifestyle. Some of the social activities and clubs include ladies lunch bunch, monthly cocktail parties, pizza party, Zumba, aqua fit, bingo, cooking classes, poker, bowling, lunch & learn, ice cream socials, and pizza parties. Residents of Marbella Lakes can truly enjoy their leisure time due to the homeowner's association (HOA). The HOA takes care of exterior-home maintenance for residents, which provides lawn care, exterior home upkeep, basic cable television, in-home security system, 24-hour guard security, and clubhouse maintenance. With its proximity to the Gulf of Mexico as well as the Everglades and with a warm year-round climate, Naples is a haven for outdoor lovers and water sports enthusiasts. Angling, boating, hiking and other outdoor recreation opportunities are plentiful. In addition, residents never have far to go to find a private, public or semi-private golf course. Shopping in Naples includes every type of store from specialty boutiques to upscale malls and unique shopping districts. Some of the best-known, world-class shopping venues include Venetian Village, Waterside Shops, Third Street South, Coastland Center Mall and Tin City. Dining options are just as varied and span many types of cuisine from traditional American to exotic Caribbean served up in casual to elegant atmospheres. Seafood restaurants range among the most popular because of the locally-caught fresh ingredients. Naples also is a very sophisticated city with abundant culture, arts and upscale entertainment for the whole family in the form of theaters, art galleries and live entertainment venues. Popular destinations include the Naples Community Theatre, the Philharmonic Center for the Arts, and the Naples Botanical Gardens. Marbella Lakes in Naples, Florida is a fun-filled resort-style community that can keep active adults entertained year-round. Clubhouse - 8,000 Sq. Ft. There are plenty of activities available in Marbella Lakes. Here is a sample of some of the clubs, activities and classes offered here. The Amalfi Collection is made up of attached homes that range from 1,534 to 2,288 square feet. These homes feature two or three bedrooms, two or two-and-a-half bathrooms, and one or two-car garages. These attached homes in the Riviera Collection range from 1,591 to 2,170 square feet. They feature three or four bedrooms, two-and-a-half or three bathrooms, and one or two-car garages. These models also have screened and covered patio areas. The Catalina Collection consists of single-family homes that range from 2,144 square feet to 3,269 square feet. These homes have two to six bedrooms, two-and-a-half to four bathrooms, and two or three-car garages. Some of these homes have one or two-story floor plans. Single-family homes within the Castilian Collection offer spacious floor plans and screened, covered patios. They have two to six bedrooms, two-and-a-half to five bathrooms, and two or three-car garages. These homes range from 2,269 square feet to 3,513 square feet. We have the Palma floor plan and are very happy with the layout for our needs. The master suite is fantastic and we use one bedroom as a home office, another as a craft room and then the 4th is kept as a guest suite. We spend a lot of time at the pool and the game room. The indoor sports court is nice as are the tennis courts and the gym. When Bob is out golfing I'm out shopping! Naples is fabulous! 55places.com is not affiliated with the developer(s) or homeowners association of Marbella Lakes. The information you submit is distributed to a 55places.com Partner Agent, who is a licensed real estate agent. The information regarding Marbella Lakes has not been verified or approved by the developer or homeowners association. Please verify all information prior to purchasing. 55places.com is not responsible for any errors regarding the information displayed on this website.